The Hib vaccine is an injection that helps protect children from contracting infections due to Haemophilus influenzae type B (Hib), a bacterium that is capable of causing serious illness and potential death in children under age five. H. influenzae type B (Hib) is a common organism worldwide; it is found in most healthy individuals in the general population. Small children can pick up the bacteria from people who are not aware that they are carriers. When the bacteria spread to the lungs and bloodstream, serious illness, including pneumonia and meningitis , can result. Another serious disease stemming from this pathogen is epiglottitis , an infection of the epiglottis that cause swelling of the airways and potential death. Pediatricians and the Centers for Disease Control (CDC) recommend that all infants are vaccinated against Hib disease. In general, the vaccine is considered highly effective, with few side effects. Before the institution of routine infant vaccinations in the United States in the 1990s, Hib was the leading of bacterial meningitis among children younger than five years of age. Nearly 1,000 people in the United States died every year from Hib disease. As of the early 2000s, the disease has largely disappeared due to these vaccinations. In developing countries, however, Hib disease is a major cause of serious disease and death in young children. The Hib vaccine is given in three or four doses during infancy, depending on the brand used. The first dose starts at about two months of age, and the last is usually scheduled at a 12- or 15-month check-up. Children older than five years do not need vaccination , unless the child or adolescent has a serious health problem that lowers immunity, such as HIV infection , sickle cell disease, or is being treated for cancer . Infants under six weeks of age should not receive the Hib vaccine. Those babies with moderate to severe illness should wait for vaccination until they are well. If a baby has had a severe reaction to Hib vaccine, another dose should not be administered. Like any vaccine or medication, Hib vaccine is capable of causing an allergic reaction. However, this is extremely rare. More common side effects include inflammation at the injection site and slight fever , which can usually occur within 24 hours of the injection and can last two or three days. Interactions with medicines or food have not been reported. The Hib vaccine is routinely given at the same time as other childhood vaccines. 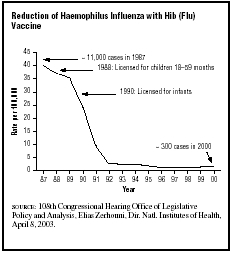 This graph shows the dramatic reduction of Haemophilus influenzae infection with the introduction of the Hib vaccine. Parents should be aware of the benefits this vaccine provides, as well as its overall safety and effectiveness. Any low-grade fever or soreness can be treated with ibuprofen or acetaminophen as recommended by the pediatrician. Serious reactions, including high fever, difficulty breathing, and fast heartbeat should receive immediate medical treatment. See also Hemophilus infections . Shelov, Steven, ed. "Immunizations." In Caring For Your Baby and Young Child: Birth to Age 5. American Academy of Pediatrics. New York: Bantam Books, 1998. "Hib - vaccine." Medline Plus Medical Encyclopedia. Available online at http://www.nlm.nih.gov/medlineplus/ency/article/002023.htm (accessed February 18, 2005). Haemophilus Influenzae type b (Hib) vaccine. Centers for Disease Control and Prevention. Available online at http://64.233.167.104/search?q=cache:2dwv-ZkB7ZEJ:www.cdc.gov/nip/publications/VIS/vishib.pdf+Hib+vaccine&hl=en (accessed February 18, 2005). Haemophilus Influenzae type b (Hib) vaccine. World Health Organization. Available online at http://www.who.int/vaccines/en/haeflub.shtml (accessed February 18, 2005).